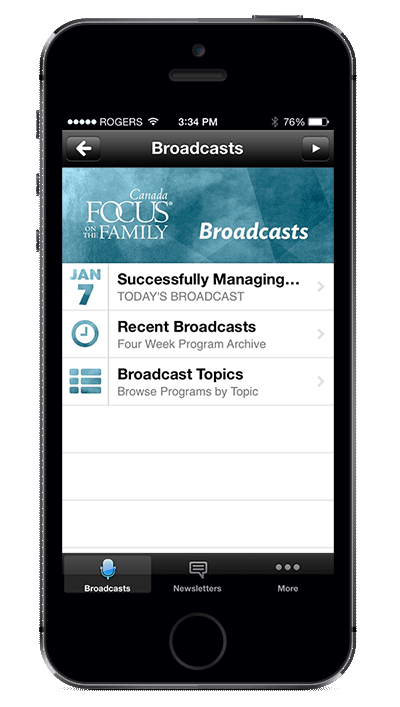 Focus on the Family Canada's mobile app offers instant access to Focus on the Family daily broadcasts through your Apple, Android or Windows mobile device. With hosts Jim Daly and John Fuller, Focus on the Family's radio show offers helpful and heartwarming stories about marriage, parenting and life from a Christian perspective. You'll hear from a variety of guests on a host of practical and inspirational topics. Take the latest marriage, parenting and Christian living insights from Focus on the Family wherever you go! What users are saying: "I am moving from England to Canada in three weeks and am still up at 4 a.m. getting ready for the moving company. I needed something to keep me awake and motivated and remembered I had the Focus on the Family app on my iPhone! So I have been catching up on all the broadcasts and the topics are all interesting and encouraging. Thank you for keeping me motivated and awake!"